Back in Shanghai after what feels like an amazing break - a true WELL-CATION =) Our Hainan trip was our first "resort holiday" together and I think we agree that it's not the last! We normally go a bit more local when we travel in China - for example by staying in local (and cheap) Chinese family guesthouses. This is always super interesting and most often ends up giving us the best experiences food-wise and people-wise. Of course rooms are never amazing in a luxurious way but we never really have big expectations and always end up being happy with the private room we get. In Moganshan for example, we have gone back to the same 200 RMB private room at "Bamboo View Guest house" 4 times and recommended this place to several friends who have traveled there as well. We know the Chinese family who runs it quite well now and love coming back to visit them (and not least, back to eating their super yummy, authentic Chinese food). Read more about it here. 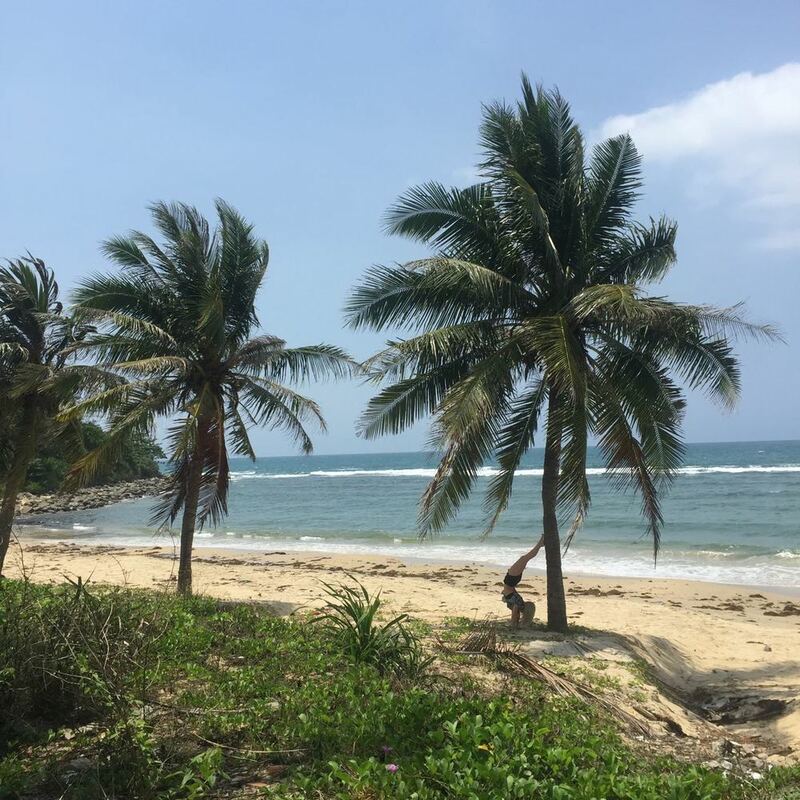 For this May Holiday trip we were in for a treat and discovered that on Hainan island you can find great resort deals if you stay away from the most popular destination Sanya (which you want to avoid anyway in a Chinese National Holiday). We knew we were not going away to explore a new corner of rural China or be out all day to hike a mountain. Instead we really wanted to have some time to relax in our room, sit on a balcony over-viewing the ocean to make some plans for the coming period in China (or out of China?) and just feel really spoiled. Mission accomplished! A long resort weekend left me feel so re-freshed, so re-charged & so happy! After browsing a bit online we chose to stay at Four Points By Sheraton close to the city Wanning (for details on how to get here, prices etc. check my other Hainan post here). Four Points by Sheraton is right next to The Sheraton (both by Starwood Hotel Group) and both resorts are amazing! The resorts share the private beach and you can easily walk between the resorts and probably use both hotels' pools if 1 is not enough for you. Four Points' Pool is like an exotic jungle lagoon with several different pools and corners whereas The Sheraton's is a "grande" style pool overlooking the ocean and great for lap swimming. The Breakfast at both resorts are absolutely amazing and worth half the room price if you ask me. The buffet contains so much from both the Western and Eastern kitchen (I'm from a true dairy country so only missing my thick natural yoghurt) and you'll find the most helpful waiters that will redo your latte 3 times until they get it right (no comments). At the resorts you find a natural smoothie shop, a noodle corner, an afternoon tea cafe, traditional resort restaurants, a beach BBQ, a coconut bar, a pool bar, a martini bar, a wine bar and probably several other bars (no we did not try them all). We mostly left the resorts for dinner and found a range of more local restaurants 10 minutes beach-walk away. We also found a supermarket to get supplies (read: beer & snacks) for our little in-room refrigerator. The water in Hainan is the most amazing water I've experienced in China and made me think the same thought as when I stepped out of the plane in Haikou airport: Is this still China? And yes this is still China which might explain why Sheraton forbid anyone to swim at their beach when the water is absolutely fine. Temperature: amazing, waves: amazing, sharks: non-exisiting. All 4 days in the resort we were met by "Double Red Flag" at our private beach meaning "Swimming is Strictly Prohibited" in Sheraton Language. This was kind of enforced by waving Chinese lifeguards but they quickly gave up on us free-spirited "laoweis" (foreigners). We didn't come to dance, as we like to say, so of course we needed a swim or 5 every day! A lot of Chinese people actually never learn to swim or they swim very poorly so I do understand Sheraton's concern. Safety is always top priority and anyone should asses the current situation at any time. But just to give anyone going here (or similar place in China) a heads up, that it might be absolutely fine to swim in the ocean even though resorts, hotels or Chinese authorities tries to prohibit it. To avoid frustrated lifeguards, just walk 50m right and jump in away from Sheraton's private beach area! Ps: Beach Yoga is always very encouraged no matter what color the flag!